On the 6th (Sun), admire the landmark architecture of Tomb of Akbar the Great, then take in the spiritual surroundings of Dayal Bagh, then admire the landmark architecture of Agra Fort, and finally admire the striking features of Taj Mahal. To find other places to visit, ratings, and more tourist information, go to the Agra road trip planning tool . New Delhi to Agra is an approximately 3-hour car ride. You can also take a train; or take a bus. In January, daytime highs in Agra are 22°C, while nighttime lows are 8°C. Wrap up your sightseeing on the 7th (Mon) early enough to drive to Jaipur. Bring the kids along to Jantar Mantar - Jaipur and Elefriend. There's much more to do: identify plant and animal life at EleSafari, contemplate the waterfront views at Sagar Lake, get engrossed in the history at City Palace of Jaipur, and admire the striking features of Jal Mahal. To find maps, where to stay, ratings, and other tourist information, read our Jaipur trip maker website . Getting from Agra to Jaipur by car takes about 3.5 hours. Other options: take a train; or take a bus. When traveling from Agra in January, plan for somewhat warmer days in Jaipur, with highs around 26°C, while nights are about the same with lows around 9°C. Cap off your sightseeing on the 10th (Thu) early enough to travel to Ahmedabad. Attractions like Kankaria Lake and Camp Hanuman Mandir make great kid-friendly stops. The adventure continues: steep yourself in history at Sabarmati Ashram / Mahatma Gandhi's Home, snap pictures at Dandi Bridge, don't miss a visit to Bai Harir Sultani Mosque, and see the interesting displays at Calico Museum of Textiles. To see other places to visit, reviews, where to stay, and more tourist information, go to the Ahmedabad road trip tool . Traveling by flight from Jaipur to Ahmedabad takes 2 hours. Alternatively, you can drive; or take a bus. Expect somewhat warmer temperatures when traveling from Jaipur in January; daily highs in Ahmedabad reach 32°C and lows reach 14°C. 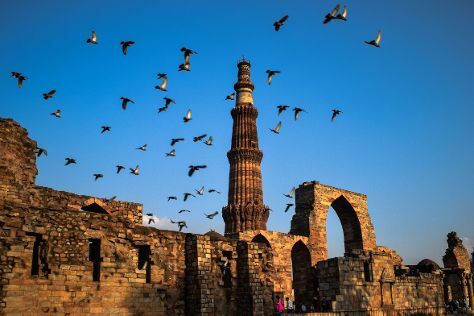 Wrap up your sightseeing by early afternoon on the 13th (Sun) to allow time for travel to New Delhi. Kick off your visit on the 13th (Sun): don't miss a visit to Kalka Mandir. To see reviews, ratings, maps, and other tourist information, go to the New Delhi trip planner . Getting from Ahmedabad to New Delhi by flight takes about 3 hours. Other options: do a combination of train and flight; or drive. Plan for a bit cooler temperatures traveling from Ahmedabad in January, with highs in New Delhi at 23°C and lows at 9°C. Wrap up your sightseeing on the 14th (Mon) early enough to travel back home.